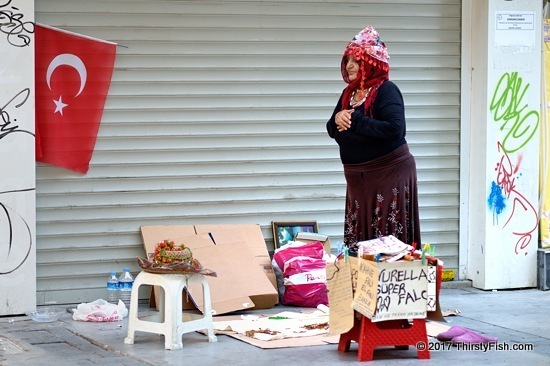 Izmir woman praying by her fortune-telling stand. Islam forbids the practice of occult arts, fortune telling, clairvoyance and more generally, claims of knowledge of the "unknowable". It also forbids the belief in these superstitions. "With God are the keys of the Unseen, the treasures that none knows but God, 6:59". It is forbidden to profit off pure speculation and taking the advice of speculators. Islam also commands the observance of five daily prayers. At some level or other we're all walking contradictions. We contradict the values we purportedly live by. But what is worst, self-deception or the deception of others? How do religions view all of this? Do they evaluate it by the magnitude of evil done? This woman did not hurt me in any way, but political and financial speculators and trained deceivers are wreaking a havoc on the lives of millions. Speculators produce nothing, only profit for themselves. Amazingly, the likes of The New York Times writers can still claim: "Speculators aren't motivated by greed ... idealism fuels their trade".